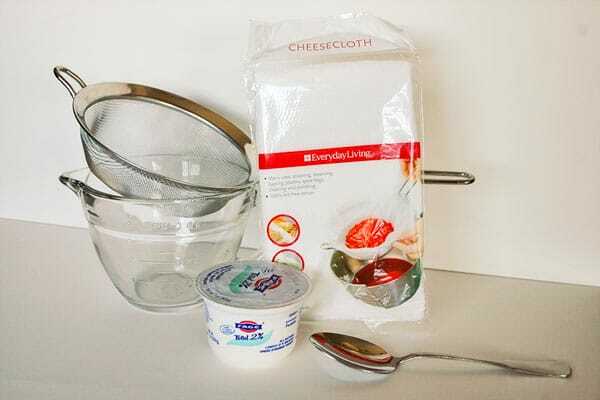 Making yogurt cheese means gathering a few simple supplies: cheesecloth, a strainer, plain Greek Yogurt and a mixing bowl. 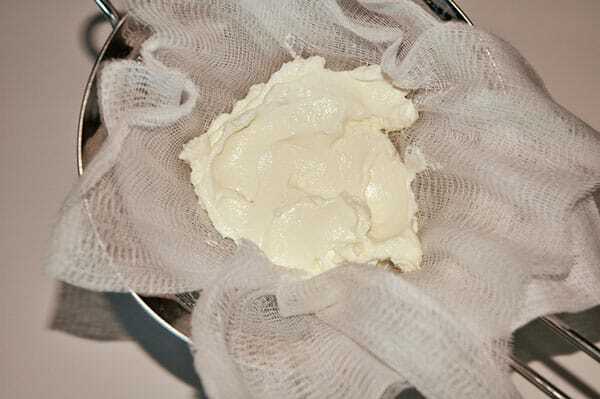 Greek yogurt spends a day in the fridge draining through cheesecloth and a strainer to produce a light, creamy spread. The holidays are over, Valentine’s Day is a memory and all the delicious, heavy treats I enjoyed are now weighing on my mind. They’re weighing in other places too. 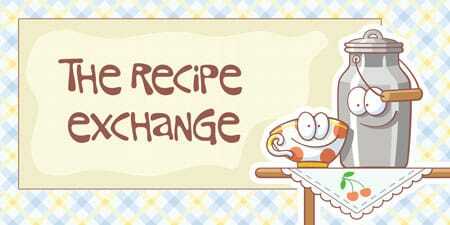 A few weeks ago, I went into the kitchen for something tasty, but I also wanted something light and fresh. Despite cold temperatures outside, I wanted a taste of spring. I wanted something full of flavor but also full of goodness, and possibly not too full of calories. Luckily, I was feeling adventurous and patient, so I decided to try something I’ve been curious about for a long time. Years ago, I became intrigued by people making their own cheese, but decided that the long, complex process was more than I could handle in my humble kitchen, with one notable exception. I kept running into descriptions of people making a thick, creamy spread using yogurt. It’s a simple process: line a strainer with cheesecloth, position it over a mixing bowl, then fill it with yogurt and allow the whey to drain off, a process which takes a day or two. I used Greek yogurt, which is thicker than regular yogurt, so my resulting cheese was thick and creamy. 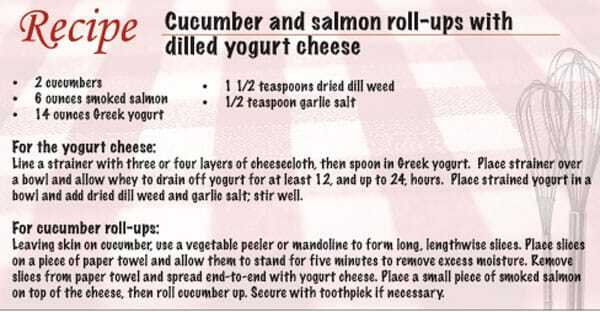 Most people use this yogurt cheese as a substitute for cream cheese. It has a texture a little lighter than cream cheese, a little creamier than sour cream, and it works as a substitute for either one. On its own, the cheese is a little plain for my taste, but I think it works as a wonderful pallet for herbs and seasonings, just right for vegetable dippers, crackers, bread or bagels. This time of year, I begin to look at ways to trim carbs and calories from my daily intake. I’ve gotten creative about ways to substitute vegetables for bread in order to eat something resembling a sandwich while still keeping the focus of my intake on things that are fresh and raw. Bell peppers and lettuce leaves are customary bread substitutes, but I got a little creative one day and used long, thin slices of cucumber. I wrapped smoked salmon and yogurt cheese flavored with a touch of garlic salt and dill and got a delicious, light and elegant result. 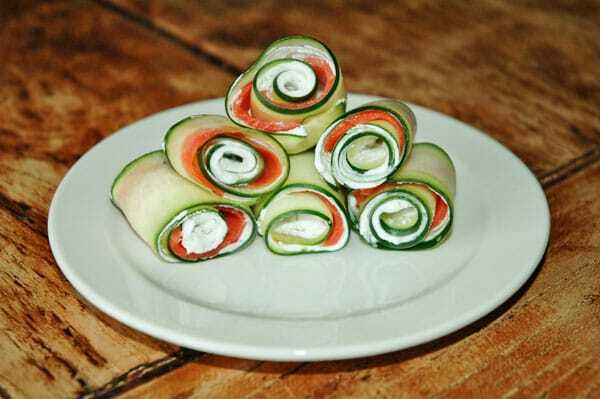 A note about slicing the cucumbers: a mandoline would work very well for this task. However, I am accident prone, and I have a number of friends who have spent time in the emergency room due to unfortunate mandoline incidents. Instead, I used a vegetable peeler and got wonderful, injury-free results.